Fluvial processes such as bank erosion plays an important role to change the channel stability of the Torsa River in the downstream region. The present study was focused on stream stability assessment of the Torsa River. The study area is situated between the downstream of the Jaldapara Reserve Forest and confluence of Kaljani River. Data of different parameters about 64 bank segments of the Torsa River were prepared using the field work techniques for assessing the stream bank conditions using lateral, vertical and overall reach stability models. The individual results of BEHI and NBS ratings show that out of 64 bank segments only 35 and 19 bank segments classified in higher categories. Overall lateral stability analysis shows that most of the sample bank segments are in an unstable condition. All bank segments are vertically unstable and degrading. Overall reach stability analysis shows widespread instability. 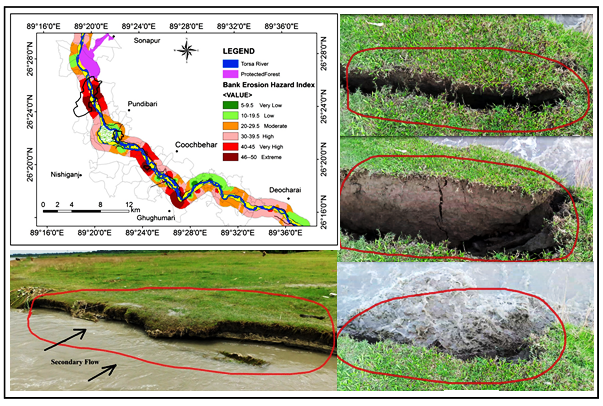 BEHI and NBS results are almost similar for most of the bank segments and therefore, BEHI and NBS can be suitable bank erosion hazard predictive models in the study for channel stability analysis. The channel morphology is determined by the interaction of fluid flow with erodible materials. Torsa River is experiencing severe bank erosion and course changing, regularly. BEHI and NBS ratings are calculated for analysis of laterally and vertically instability of Torsa River channel. 35 and 19 bank segments are classified in higher categories of BEHI and NBS ratings. Most of the sample bank segments are laterally and vertically unstable and degrading. BEHI and NBS cab be suitable bank erosion hazard predictive models for analysis of channel stability of Torsa River.